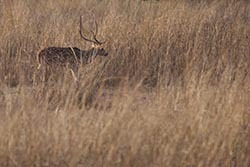 Tadoba Andhari Tiger Reserve is a 625 sq. kms. reserve in Chandrapur District in the State of Maharashtra. 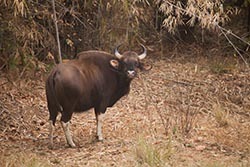 It is one of India's 43 "Project Tiger" reserves. The name ‘Tadoba’ is the name of the God ‘Tadoba’ or ‘Taru’, praised by the tribal people who live in the dense forests of the Tadoba and Andhari region, while the Andhari is the river that meanders through the forest. Legend holds that Taru was a village chief who was killed in a mythological encounter with a tiger. A shrine dedicated to the God Taru now exists beneath a huge tree, on the banks of the Tadoba Lake. The temple is frequented by adivasis (tribals), especially during the fair held every year in the Hindu month of Pausha, between December and January. The Gond kings once ruled these forests in the vicinity of the Chimur hills. Old signposts made of stone pillars to mark the roads stand witness. On a weekend, I landed at Nagpur which is about an hour's flight from my hometown Pune. Accompanying me were 5 friends. 6 is a good number to visit the reserve as the open Gypsy that takes you on the jungle safari sits 6. Nagpur is the nearest airport from the reserve. It's a good 3-hour drive from there. Please plan your trip at least 2 months in advance. That's when the online booking commences. 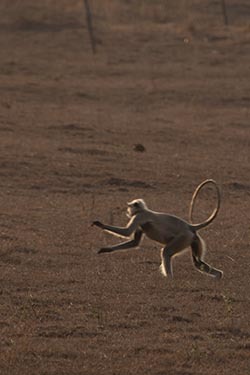 On weekends, public holidays and during school vacations, the reserve can really get very busy. Each safari lasts for about 3 hours. There are two everyday - one each in the morning and evening. For my trip, I took the help from my friend Atul Dhamankar who is an acclaimed wildlife photographer and lives near the reserve with his brother. You can easily find him on Facebook. The safari costs about Rs 2500 per trip and comes with a driver and a guide. You don't have the option to choose your driver or the guide, they come by a queue system. Rest assured, they are all quite knowledgeable. We reached Nagpur at 9AM. By 12:30 we were at the gates of Maharashtra Tourism Development Corporation's lodge which would be our home for the 2 nights that we would be there. We had booked for 4 safaris. The lodge is a comfortable place with air-conditioned rooms and clean beds. It has a restaurant which serves wholesome food. Breakfast is included in the room rates. Just so you know, there is no such thing as guaranteed sighting. You really need to be lucky to be able to spot the tigers. We roamed around for over 12 hours in the 4 safaris that we had planned and we never could see the tiger up-close. Thankfully, we could spot one a few hundred metres away. Though I had a 400mm lens with me, it was not enough. I got a picture, a blurred one though. 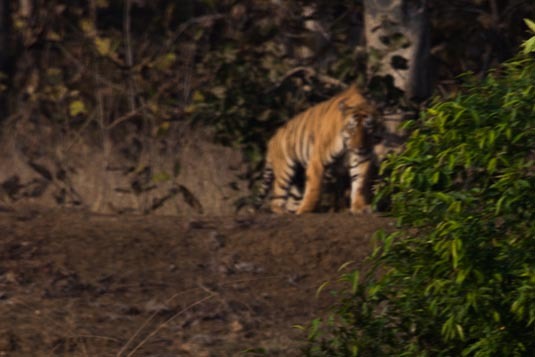 On one occasion, we saw a tigress with her 3 cubs walking away. Unfortunately, it was a one way road for the traffic so we could not follow them. By the time we completed the circle hoping to face the tiger family, they were gone. So be it. I guess, it's an experience in itself to be on the pursuit to spot a tiger. After all, a tiger is a very reclusive animal. The safaris did give us the opportunities to see various animals and birds including the deer, monkeys, gaurs, parrots, eagles and a massive crocodile. Well that was it. On the 3rd morning, we took our 4th safari, and took the car back to the airport to head home. To be honest, I was a little sad as I could not see the tigers the way I had expected. But no regrets, more visits are definitely on the cards.